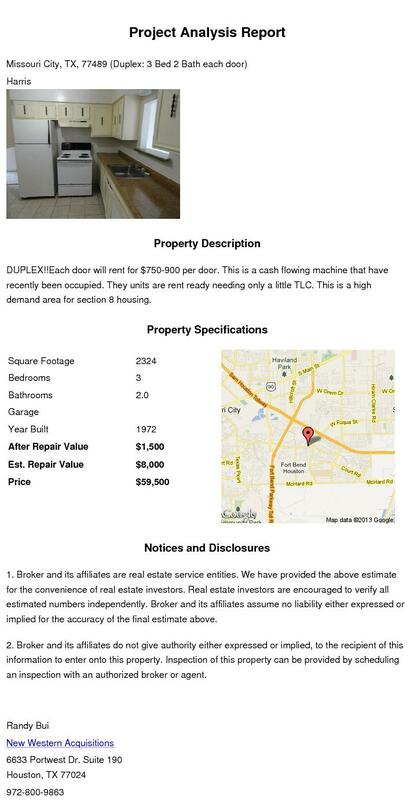 American Wholesale Property: Duplex in Missouri City! This website is designed to give YOU, the investor, the power to purchase at an unprecedented scale. DUPLEX!! Each door will rent for $750-900 per door. This is a cash flowing machine that have recently been occupied. They units are rent ready needing only a little TLC. This is a high demand area for section 8 housing. Looking for an investor-friendly real estate agent in Houston, Texas? SUBSCRIBE to my BUYERS LIST! (Updated 2016) 9 tips to help new investors get started in real estate. House in the Northeast for $26,500! Alta Vista - Buy at 36k sell at 135k!